If there are two things the city of Louisville, Kentucky, is known for, it's bourbon and horses. In 2003, the city created a community-wide public art project called Gallopalooza, Louisville's Sidewalk Derby. Local artists decorated life-size horse statues, then sponsors purchased them and placed them on sidewalks and street corners around the city. All proceeds from the sale of the colorful horses benefited the city's beautification efforts. The project, which has now raised over $1 million, was so popular that a second Gallopalooza horse project – Gallopalooza, The Horses of Possibility City – followed in 2009. Since bourbon has now become such a huge tourist attraction in the city, Louisville Mayor Greg Fischer asked Gallopalooza organizers to consider adding a bourbon element to the public art project. 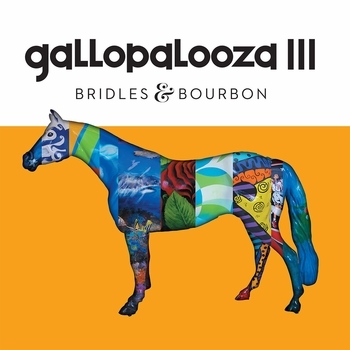 They launched Gallopalooza III in 2015, with a theme of "Bridles & Bourbon." Six-foot-tall mint julep cups and smaller horses balancing on bourbon barrels have now been added to the much-loved traditional horse statues on display around the city of Louisville. Gallopalooza III: Bridles & Bourbon, is the third volume in the colorful set of commemorative books produced to capture the images and the spirit of Louisville's popular and highly successful Gallopalooza public art program.